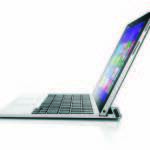 The Lenovo Miix 2 10 is a 2-in-1 Windows 8.1 tablet with a keyboard dock, not a laptop with detachable tablet! 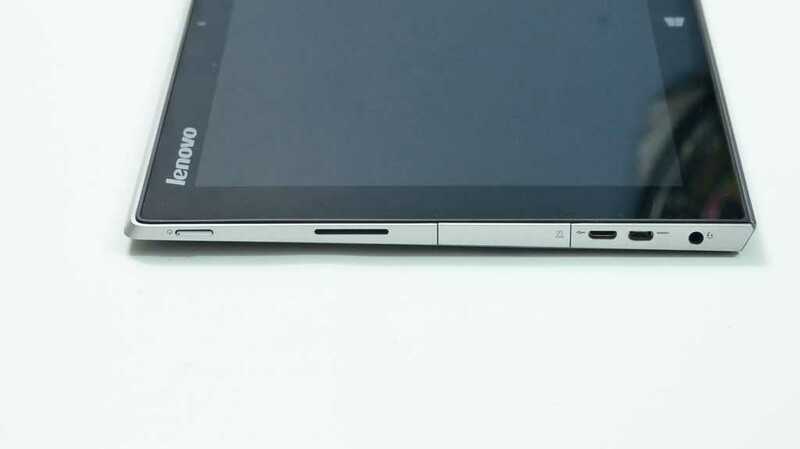 You’ll find out why in the detailed Lenovo Miix 2 10 review below along with details on performance, battery life, usability and quality. We’ve also included a comparison with the ASUS Transformer Book T100. Specifications, Images, links, videos, comments and more information can always be found through our database on the Lenovo Miix 2 10 information page. 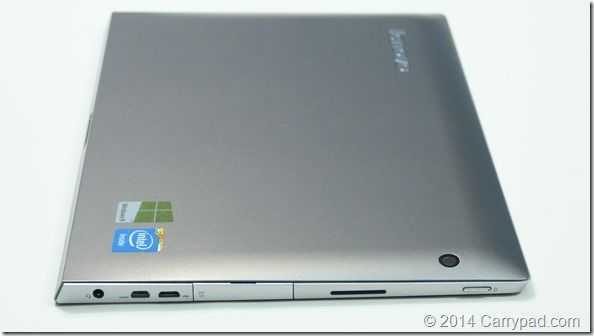 For this 64GB version (model 59404517) we paid 469 Euro including German sales tax of 19% using a special offer . Current price is now 499 Euro. Packaging was good and we were pleased that the Lenovo Miix 2 10 looked well designed in terms of style and materials. Initial reaction to the screen and keyboard was positive but you can find more detail on that below. A matt, angular finish appears clean to the eye but it’s very different to the rounded-edge glossy offerings that are available. The ASUS T100 is the polar opposite in terms of finishing, for example, but it’s up to the reader to decide what they personally like. With those angles come some annoyances in comfort. The classic portrait-mode one-handed method could be more comfortable. Two-handed, as you’ll probably be using more often than not, isn’t so much of an issue. With a matt finish comes more friction for dry hands but also less scratch resistance and we’ve already seen a few minor scratches appear. 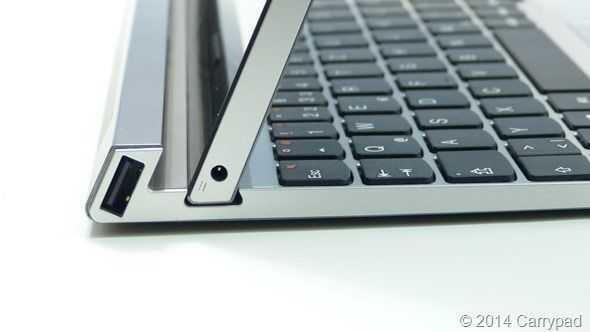 The reason that the Lenovo Miix 2 10 is tablet first is because of the magnetic catch on the keyboard and tablet. The tablet simply sits in a grooved stand on the keyboard and there’s no angle adjustment and the tablet is not locked into the unit while in transit. Think of the Lenovo Miix 2 10 as a tablet with a magnetic keyboard that might need extra care when carrying. We’ve done some tests which gave us confidence but still, be careful. 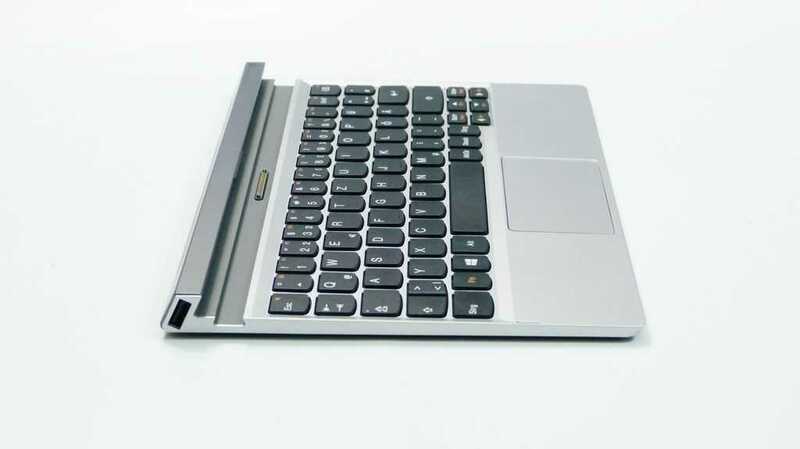 The other disadvantage is that as soon as you start to close the tablet against the keyboard the connection to the USB ports on the keyboard are lost. On the plus side you get a tablet that’s extremely easy to remove from the ‘dock ‘ and one that can be reversed which is a great advantage for travellers using small seat-back tables to watch films. The build-in speakers won’t be used in that scenario but as a bed-side tablet the look and the sound quality are good enough. By having a magnetic catch you also reduce the need for an unsightly locking mechanism. The Lenovo Miix 2 10 would fit well in a living room but it’s a shame the audio does not extend through the keyboard dock so that external speakers could be attached. The weight of the tablet is good. With a 1920×1200 screen (16:10 ratio) you get an impressive amount of information on the screen and the additional 120 pixels (vs a 1080 resolution) is quite noticeable. 619 grams for a 10-inch display like this is useful. Naturally we want to see that weight figure go way, way down over time but right now it’s at the point where the extra screen size could outweigh the weight advantage of an 8-inch Windows 8.1 tablet. The 8-inch vs 10-inch discussion is one we’ll have here in more detail soon. As you can see, the keyboard dock is also a USB dock. It’s only USB2.0 but it’s extremely useful for a keyboard/mouse and perhaps an external drive or USB WiFi module. (More on WiFi later.) Note to new owners: The USB ports are a really tight fit. 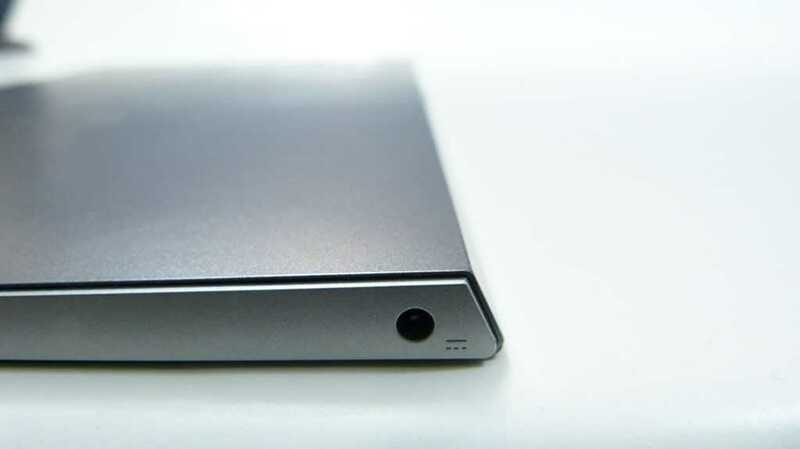 An audio output also feeds into the dock to power a ‘sub-woofer.’ A bass unit it is not but it does extend the range of the tablet speakers and boosts the volume. It works with the tablet docked in either direction, as do the USB ports. There is no additional battery in the docking station. On the tablet you have a reasonably loud and clear set of speakers, a volume rocker and power button. There’s no screen rotate-lock button. A capacitive Windows button requires a more solid, longer press than we’re used to. In terms of ports you have a 12V DC input port. The charger is included. 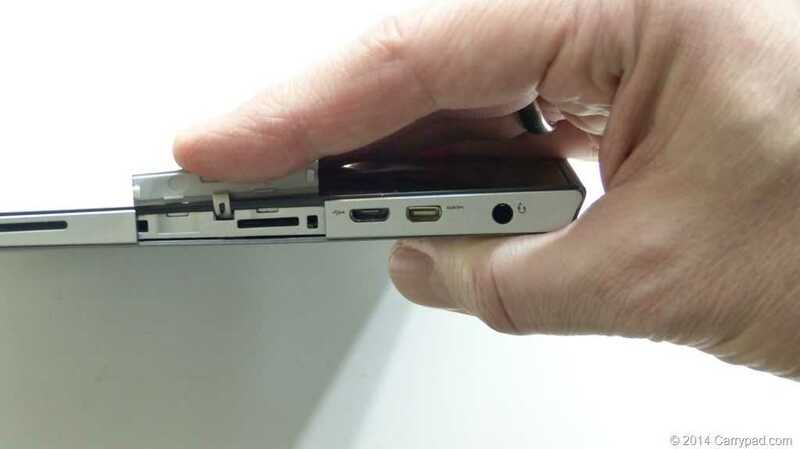 There’s a microUSB2.0 port that can also be used to charge, albeit very slowly, the device although we see no evidence of that being a feature in any of the Lenovo manuals. Finally you’ve got the microHDMI, headset port and, tucked away under a flap, a MicroSD card slot with SDXC and SDHC support (64GB SDXC tested.) There’s space under the slot for a microSIM card slot too so expect a 3G/4G version in some regions. The built-in microphone is a single unit, not an array unit. Camera The 5MP camera was unimpressive and seems to be a fixed-focus unit. A 2MP front-facing camera is available for video conferencing. Lenovo include a camera application which, given a good dose of daylight, might prove fun to use but overall, quality seems to be poor. Security: As with other Baytrail-T tablets there’s full-disk Bitlocker encryption available when you use a Microsoft Live account to log into the device (Encryption keys are held in your MS account.) Secure boot is standard and we haven’t yet investigated any boot/BIOS settings that might disable this. There is no GPS or NFC built into this Lenovo Mix 2 10 model. The keyboard has good and bad points. The key mechanics are very good for such a small device and the main A-Z keys are relatively large. Full-size even. That size comes at the expense of a function-key row and additional keys on the top row to accommodate keys missing elsewhere. The result is a good keyboard to type a letter on until you get to the numerics which are off-set compared to the usual layout. The 1-4 keys are the worst but there are a few others that can catch you out too. If this is a keyboard you’re going to us a lot then it could work out very well. 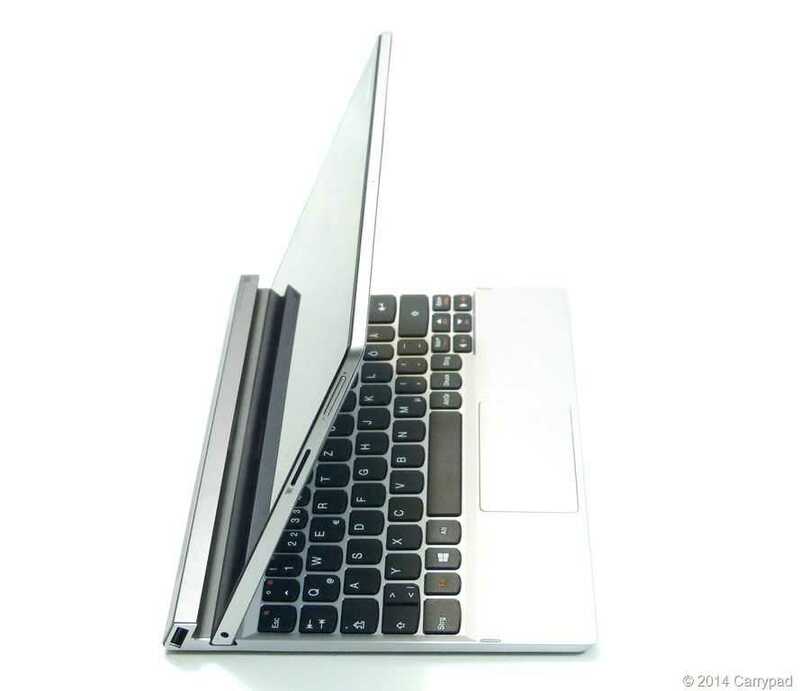 If you switch between this and a standard keyboard however, you might find yourself preferring a standard layout with smaller keys as on the ASUS Transformer Book T100. 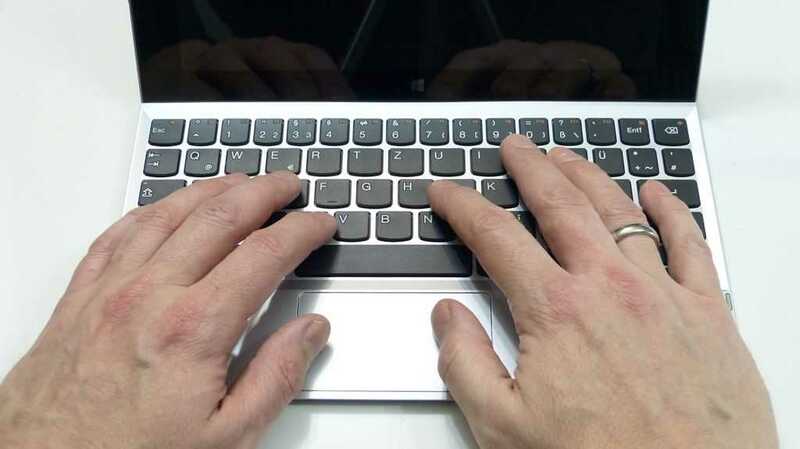 The mousepad is a single-touch unit but on a device like this where the multitouch keyboard is just a finger-stretch away, that might not be an issue. The mousepad button, integrated into the pad, are good and have a comfortable click. In comparison with the ASUS T100 the touchpad is a lot better but nothing like the multitouch units you’d expect to see on a standard modern laptop. With the keyboard in use it’s not recommended to pick the unit up by the keyboard and move it around as you might do with a laptop. The Miix 2 10 is about 200 grams heavier than an 8-inch Windows tablet but includes so much more space and much higher pixel-count there’s a good argument to be made for using this 16:10 screen over an 8-inch screen. Both will require two hands and both can be used for reasonably long periods. It’s only when you’ve been reading for a long time that you really fancy the lighter weight and size of the 8-inch Windows 8 tablet, but then, if you’re reading, why not get a cheaper, lighter and thinner 7-inch Android tablet for that? We think the 10-inch size at 600 grams and below is going to be more popular for general consumer-style use with Windows 8.1 modern apps and makes a more usable desktop–sized screen for occasional desktop applications use. If it’s the ultimate in PC efficiency and mobility you need then yes, the 8-inch Windows 8 tablets are better but do try the 10-inch tablets before you decide. Obviously there’s no noise on this fanless tablet but there’s also a comforting lack of heat. If you leave it charging and working hard at the same time you’ll feel a patch of warmth on the rear but it’s when it’s not charging, when you’re using it as a tablet it won’t be a problem. Note: We had a total failure of the system after 5 days of testing. The unit failed to charge at all and had to be returned for a replacement. As for the screen it’s a reasonable IPS model with no color cast or backlight issues that we could find. Brightness and viewing angles are better than the ASUS Transformer T100 we have here but there’s still a drop-off in brightness that starts at about 20-30 degrees away from being perpendicular to the eye. It’s not perfect but it’s pretty good. The overall brightness is good and direct comparison with the ASUS T100 showed it to be better. You might want to turn off adaptive brightness in the advanced power settings though as in low light levels you can see the brightness adjusting and it looks like a flicker. Page 2: Performance, Battery Life, T100 comparison and summary on Page 2.
hi chippy – thanks for being the internet’s official miix 2 10 correspondent! i’m really interested in the machine, which is now on sale in uk via lenovo website for 429.99 (bit steep but what i expected), but need clarification on the office home and student situation as it’s crucial for me. the description on lenovo us site says a full version of office is included, but according to the questions section (with ‘expert response’) it’s only a trial and you have to pay for full licence. the uk site doesn’t mention office in the features at all. please could you reveal the truth? cheers! I have a full Office Home and Student licence here. On the 11-inch version I understand you only get a trial. Maybe that’s where the difference occurs. I will double-check the license right now though. …and here’s the license that came with the Miix 2 10. This is a German product but i’m sure that they all qualify for the ‘WIndows Small Screen Tablet’ free license when they are Baytrail and 10-inch or under. 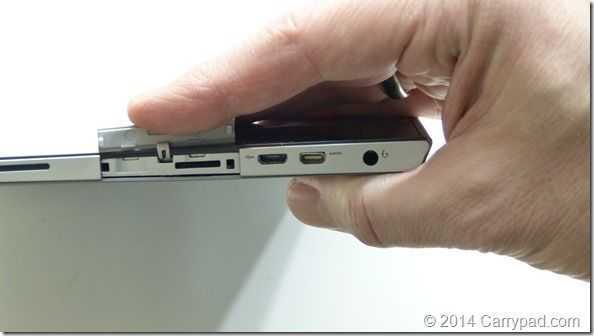 The micro SD card slot on the t100 is also on the tablet, so that should not be a pro for the Miix 2 10. The name for the t100 is also much better. 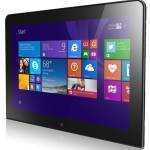 Miix 2 10?? REALLY? You are correct. I made a mistake on the MicroSD. As for the charging, it’s a problem when you want to use the USB port in tablet-only use. E.g. When used as a ‘desktop’ you need USB for keyboard + mouse, you need HDMI for monitor and you need to keep it powered. That doesn’t work with the T100. Correction: I now see your logic. I’m sorry but I was thinking of the 8-inch tablets where there is no dock and therefore any attempt to charge the device blocks the only USB port. On these devices with USB hubs, that’s not a problem unless you wanted to do something with the USB port in tablet mode while charging…something I don’t think will happen. I’ve updated the review. the lack of GPS, digitizing pen and 3G/4G (for now at least) makes me look elsewhere. Any chance you could do a Fujitsu Q584 review Chippy? The specs of the Q584 looks really interesting, but I would like to read an in-depth review before deciding on a buy. Just want to double check that you are sure there is no GPS. The product page on the lenovo site says there is GPS and the product expert on the q&a section also confirmed there is GPS. Thanks! I read that too. There’s the standard Windows 8 location driver (network-based GPS) on this module but no dedicated GPS. Often the GPS module is co-located on a 3G module so that might be where the specification came from. Now that i have read the full review as well as seeing the price for this on Lenovo Uk Site i am more happy with my Yoga 11s as i got it for cheaper and you get a whole lot more device for the money. My Miix 2 10 arrived today. I’m having issues with the keyboard dock. Do you find that you have to push the tablet down into the dock to get the connection to be made? If I take the tablet out of the dock and then put it back in, the keyboard will not be recognized unless I push down on the top of the tablet in order to secure the connection on the bottom. I hear a “chime” when removing the tablet from the dock and when it connects again (following the above procedure). The pushing down to connect does not always work, so I’m finding the connection to be finicky. Thank you in advance. So I tried one out today, and it was by far the buggiest keyboard I’ve ever used. Try using it on anything except a table and it will constantly disconnect. Not to mention, i didn’t think the key differences would be that bad but they are just really really strange. They either need a better magnet system or something but it’s just so wobbly and had to use on a lap. Chippy, I am in the US, had my Miix 2 10″ for 2 days, worked so hard to get all configured with ALL my personal files and on day 3, would not boot up (had full battery when I worked on it hours before). We tried everything…Lenovo sending a new one. So there must be a problem with these. Mine was manufactured Jan 18, 2014…maybe a bad run. I would be interested if any of our readers have problems. Otherwise, I loved the functionality and performance. Thanks for the extensive review! I’m currently looking for a small, cheap but decently designed Win 8 laptop that will get some occasional use on the road/overnight but mainly be a backup for my main computer, and when at home will be hooked up to a bigger monitor/keyboard & mouse and the tablet will be acting as a second screen (so the higher res the better). 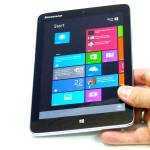 The Miix 2 seems ideal. Just one question – for work, I have to access an external system via VMware Horizon. As far as I can tell there’s a client available for Windows 8, so this should mean the speed limit is basically my broadband and not the computer. Do you have any idea if the Miix 2 would cope well with this setup, or should I really be looking for something above the Baytrail performance-wise? Thanks! Hi Chippy,thanks for the very nice review, but it left me a question. I´m a student and want a smart and portable Win8 Tablet with a keyboard dockingstation, wich I can take for a day out without charging. I´ve got to write a little longer textes with it and to do some PowerPoint prestentations. I want to watch some videos and films on it and play sometimes some games. 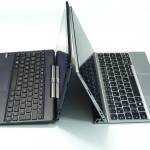 So wich one do you recommend me the Lenovo miix 2 or the Asus t100? For a more laptop-like experience, the ASUS T100. The Miix 2 10 is more of a home tablet + dock solution IMO. Note to anyone looking to buy a Miix2 10 – seems to have been pulled from the Lenovo shop. It’s still listed on the site and still even has a price, but you can’t add it to your cart. From comments on other forums this seems to be happening all over the place, so it suggests at best very limited stock, and at worst some sort of flaw in the existing run of units. This could be related to the issue I had with mine (and I heard from another owner.) Mine stopped working three days after I bought it. My current device is fine at the moment. I think they’re also having major issues with the touch screen. I loose the use of mine periodically as do several users over on the Lenovo forum. It seems to be endemic and hopefully can be hammered out in a bios or firmware update. I have feeling it is suffering from a bug or two. I got mine (European / Nordic version made 12.01.2014) on last monday, and after some rounds of Windows updates it lost contact with the keyboard and track-pad before it locked itself. The only sign of life was the mouse pointer from my bluetooth mouse. The screen was black, but the pointer moved around. Impossible to switch off with power button. Pressed it for more than one minute. Left it over-night to drain the batteries. According to the Windows log files it went dead after about 15 hours. I tried to wake it up in the morning before I left for work, but still dead. When I got home in the evening it had drained the battries, and it did start up normally when connected to the charger. When the batteries was fully charged I switched it off (NOT sleep). It would not wake up before I connected it to the charger. I have tried this several times but it seems OK now. I will return my unit for a full refund. I seems quite silly to make a Windows PC that can’t be reset without draining the batteries. A tiny little hole giving access to a physical reset switch can’t be that expensive? How much free disk space is left? 26.5GB is left as free space. No, its not that much left. I have read it should be possible to move the recovery partition to an external USB-drive. That will free up about 12.5GB. Its actually another recovery partition using 1GB too. I don’t know if that can be moved. 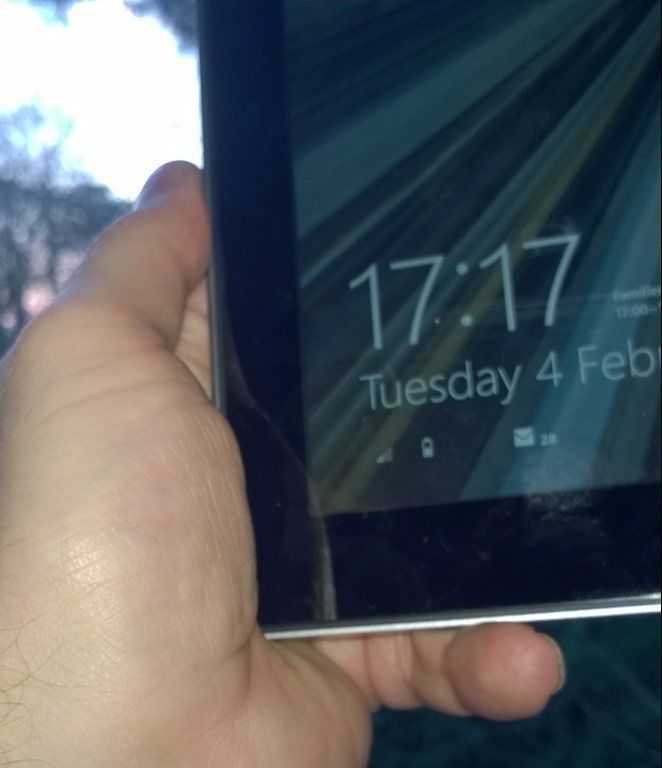 Hi I have bought this tablet and when I connected it to dock nothing happens. Am I supposed to download any driver something please help? No, you don’t need to download or install anything. Thanks for the review, was looking at this to get a feel for the 11 inch version. 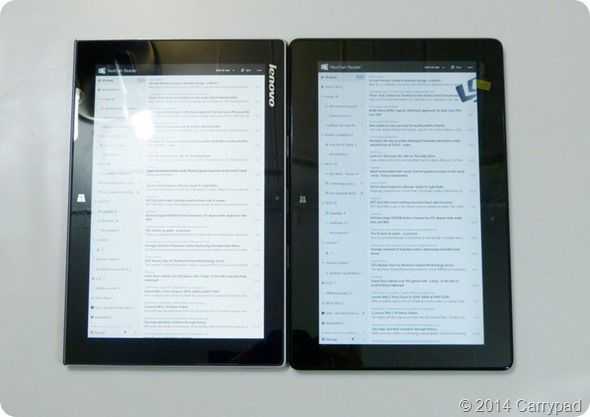 Not convinced now it looks like the Surface 2 might still be better. With regards to this model the downside for me is that they penny pinched. The z3770 is a much better chip than this z73740- I have a Omni 10 and a tosh encore and its noticeable.